Our good old TV has been an important part of everyone’s lives for so many years. It brings us entertainment, relaxation, and a means to be up-to-date with what’s happening around the globe. Today, a wide range of entertainment and quality programming is available 24/7 for everyone to enjoy – all people need is a means to watch them in way that fits their lifestyle and budget. Good thing, SKYcable has launched an affordable solution so that many more can unwind and have fun with all the shows and movies available on digital cable TV. As some households begin to draw away from the hassle of paying monthly bills for cable TV services, SKYcable introduces another innovation: SKYcable Prepaid. It is available at ₱99 and ₱250 variants, with each offering unlimited cable TV viewing for 30 days. Prepaid subscribers will have access to up to 35 standard definition and 4 high definition channels through their SKYcable Digibox. As a bonus, those who subscribe are instantly loaded with two months access to the ₱250 variant channel line-up.They also get a free ABS-CBN Mobile SIM that has a bonus of 800MB worth of internet access for up to 30 days. Subscribers can enjoy additional free channels and exclusive shows when they reload. To stay up to date on SKYcable Prepaid promos, subscribers can simply tune-in to the Prepaid Info Channel - Ch. 223 in Metro Manila, CAMANAVA, Rizal, Cavite and Laguna and Ch 58 in Bacolod, Cebu, Davao, Dumaguete and Iloilo. Plus, as an added perk to those who have the SKYcable Digibox HD, the iRecord feature is included, allowing them record and playback shows, as well as pause live TV. 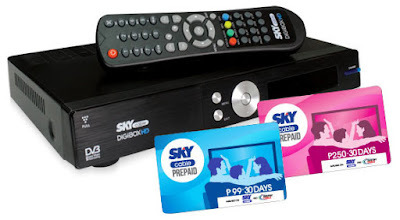 Maintaining SKYcable Prepaid is easy and completely at the subscriber’s convenience. To reload at anytime, they can simply use the ABS-CBN SIM that comes upon installation. As long as the SIM has enough credits, all they need to do is text SKY<type 250 or 99><type SKYcable prepaid smartcard number> and send to 23667. Subscribers can also load though 7-Eleven outlets, V-Mobile, and other authorized loading stations. Proving that only SKYcable offer the bestvalue in all its products, the ₱99 option comes with Cartoon Network HD, perfect for kids who want their favorite toons and anime in vivid detail. Those who choose the ₱250 option can watch National Geographic HD, Disney Channel HD, and HBO HD – a powerhouse suite of channels everyone in the family will love. Both options have access to digital cable TV favorites like Cinema One, Toonami, BTV, Teleradyo, Cinemo, Knowledge Channel, Yeyand Jeepney TV. Enjoy the fun and entertainment the cable TV viewing has to offer. Subscribe now to SKYcable Prepaid to enjoy the perks of digital cable TV that lets you maintain your budget, all without the hassle of monthly bills. That's nice that you can get cable thru prepaid. I've never heard of Skycable. This is perfect for people who don't watch TV all the time. It's a nice way to save money from monthly cable bills. Great deal, I remember we have cable before and it was very enjoyable to watch such awesome tv shows. This is awesome to save money in cables. We have Time Warner Cable with the rest of our phone and internet in one bill. This is another milestone in TV watching. Now people can have access to cable channels that doesn't cost much. Nice!